JACKSON, Tenn. — Vandals defaced a church in a small Tennessee town this past weekend, leaving behind Satanic messages for the congregation. On Sunday morning, members of the Lebanon United Methodist Church arrived for services to find that someone had used the facility not for prayer, but to glorify Satan. Ashes were also found scattered around the sanctuary, and sprinkled in the offering plate, indicating that the person had been smoking. However, that was not the worst of the attack. Members found that the vandals permanently etched the phrase “Smoke meth and hail Satan” into the church altar, made of wood. An upside down cross was also inscribed with the numbers 666 in another area of the altar, and the Bible was turned to page 666, where the page was then burned. According to reports, the small church is only comprised of approximately 20 members, and is usually left open so that those who wish to come and pray may do so at any time. However, now the pastor is considering whether he will lock the doors or install security cameras to catch those who deface church property. Police have not yet named any suspects, but are asking those with information to call the Madison County Sheriff’s office. Last month, a similar incident occurred at Hudson Chapel Christian Methodist Episcopal Church (CME) in Medina. 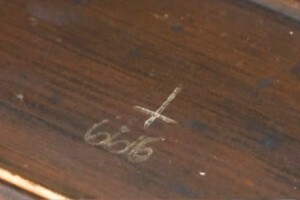 Congregants arrived to find the name “Satan” carved into the pulpit and a circle with the letter “A,” representing anarchy, spray-painted on one of the pews. Police are considering whether the attacks were carried out by the same vandal. Williams told reporters that she forgives the person who vandalized the church. Churches across the nation are regularly in the headlines surrounding instances of vandalism and robbery. This past weekend, members of Grove Avenue Baptist Church near Richmond, Virginia arrived to find that someone had smashed in a window and stole cash from one of the offices. In Holyoke, Massachusetts, a masked man entered a Pentecostal church during services last month and robbed attendees at gunpoint. He took a number of cell phones, including other items, according to reports. Additionally, a family in Slidell, Louisiana is facing charges of “Simple Burglary of a Religious Building” after it was discovered that they had repeatedly burglarized a local church–from musical equipment to electronics–and sold the items in their garage sale.